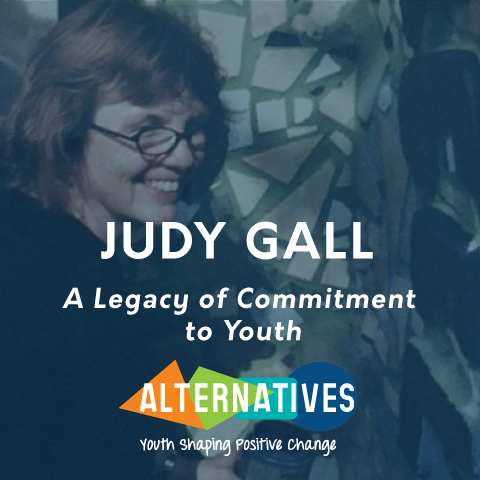 Celebrating Judy Gall - A Legacy of Commitment to Youth - Alternatives, Inc. In honor of Judy’s retirement and to support her legacy through Alternatives’ work with Chicago’s youth and families, Alternatives is establishing a reserve fund in her honor, the Judy Gall Legacy Fund. The reserve fund will be dedicated to supporting the work that she started at Alternatives, including innovative youth programming, a new South Side office in Washington Park, and investments in impact evaluation, staff professional development, and strategic capacity-building to ensure the long-term sustainability of Alternatives’ work. Alternatives’ Board and staff have set the goal to raise at least $100,000 before the end of December. As of December 27th, we have just over $88,000 in donations and pledges. We need your help to get the rest of the way to our goal! You can help support this by donating or creating a page within our Crowdfunding page. Our Crowdfunding goal is $25,000! If you need assistance with setting up a crowdfunding page, please contact Kirsten Rokke at krokke@alternativesyouth.org. Come celebrate with us! This festive event will bring together generations of Alternatives’ staff, partners, and supporters to look back at the many ways Judy and Alternatives have changed lives and communities through a consistent commitment to youth. Admission is free, but we ask that you consider making a contribution to Alternatives in Judy’s honor. Heavy hors d’oeuvres, wine and beer. Attire is business casual.